Metro’s website has now been updated. 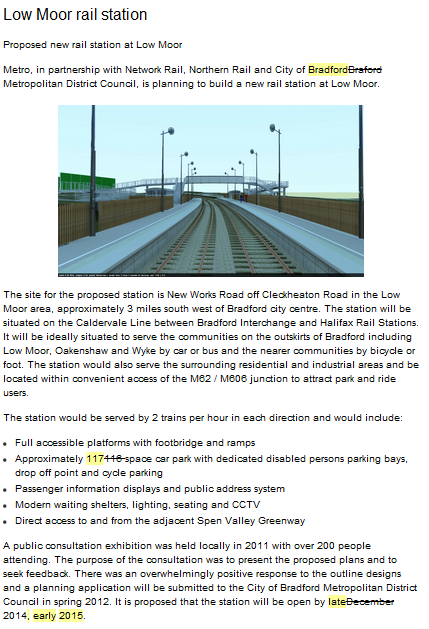 Low Moor railway was previously due to open in “December 2014”. This has now been updated to “late 2014/early 2015”. The most logical time for the station to open would be 14th December 2014, railway’s principal change date. And from a publicity aspect if the station was due to open early, then why change the date? Therefore it is reasonable to assume that the date will actually be “early 2015”, and the most sensible time for introducing the service would be the 15th May 2015. 3 years away. We are concerned that the station is being pushed down the track and that the residents of Low Moor will continue to have a railway line with no station! – The creation of a railway leads to economic growth and increase house values.